I’ve probably mentioned this before but I’m not really big on stars and stardom and the like. I love me some movies but I’m really not a fan of movie stars or athletes either despite the fact I love sports too. Even as a kid I never had posters, I don’t read People or watch TMZ and outside of throwback jerseys I’m not all that comfortable wearing another man’s name on my back. Weird, I know, but that’s just me. 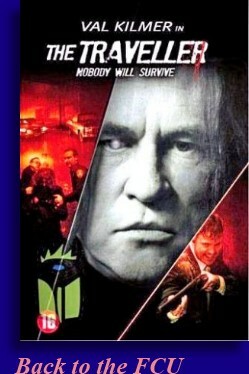 I mention this because after viewing Val Kilmer’s latest straight to DVD waste of time ‘The Traveler’ and after reading up on this film a little bit, Kilmer’s fans… of which there are many… seem less upset that the movie was crap and more concerned about the state of Val Kilmer personally and his career. I could care less of course because as I said before I’m not paying anybody’s rent or child support so they can do whatever they gotta do to get over but Val… if you happen to be reading this (as if)… your people expect better from you. On a rainy Christmas Eve the five sheriff’s deputies and one detective are manning the skeleton crew simply trying to pass the time when a really strange dude (Kilmer) walks in out of the rain, dry as bone, and declares that he is a murderer. Six times over. Mr. Nobody, as he will call himself, has no finger prints, has the ability to wiggle out of handcuffs and jail cells like Harry Houdini, doesn’t show up in mug shot photographs and seems to know an awful lot about these six enforcees of the law he’s going to be spending some quality time with. Why is this? About a year ago some never-do-well snatched up and murdered the young daughter of detective Black (Dylan Neal) and detective Black was convinced that this drifter he found was the one who took his daughter. So the detective and five of his deputies, the five on duty tonight, get this drifter in a cell and proceed to torture the hell out of him until he talked, but he had nothing to say mainly because he claims he didn’t do this thing. Just in case you doubt somebody snatched up little Mary, we get to watch some mysterious figure take the poor kid like six time in this movie. Just in case you have any doubt that these six officers abused this homeless dude, we get to watch that over and over and again as well. I get it already. But back to the business at hand. The Stranger or Mr. Nobody proceeds to confess to his first murder and sure enough our first officer bites the dust in a horrible manner. Systematically the Stranger confesses and systematically our law enforcement officers die off in the most unfortunate of ways. But who is this stranger? How is he doing this? Why is he doing this? Why can’t we all just get along? Directed by Michael Oblowitz, ‘The Traveler’, formerly called Mr. Nobody until another movie snatched up that title, does have some things working in its favor. It just failed to capitalize on these things it had going for it. The atmosphere that Oblowitz and crew setup was suitably creepy with all of the rain and the incessantly blinking fluorescent lights and what not, and sure Val Kilmer looked detached and seemed to be not all that interested in being in this movie, but considering his character is like a ghost spirit or something, it kind of worked in a weird way. Plus the core concept driving the narrative wasn’t half bad. But that it’s for the good stuff my friends. The characters in this movie, including Mr. Nobody, were all blandly uninteresting with this amplified by the fact that there wasn’t a single character worth rooting for in this movie. When these characters start dying you would like to feel something for them, either hoping that somehow they can pull through or maybe just hope that they die even more horribly, but there was nothing. They did seem to be getting what they deserved but Mr. Nobody was so bland and creepy that we can’t root for him either. Another thing that might’ve helped ‘The Traveler’ was a tighter edit to quicken the pace a bit. Constantly flashing back to scenes we’ve already scene, over and over again, didn’t help matters and while I’m sure the murder scenes were supposed to be the gorrific tour de force, they went on far too long. The worst of which was the suffocation sequence which had to have lasted a good ten minutes. I get it already, the character is suffocating. By the time the effects dude behind the camera started throwing those pieces of bloody liver chunks the crew picked up at Kroger towards the windshield, I’d about had enough. But alas it still wasn’t over as we had a couple more characters to kill and a ‘twist’ to get through with all of it being so underwhelming. ‘The Traveler’ did have some promise as decent mystical horror / thriller but tragically none of this promise was realized. But Val, where I only see as far back as the last movie you made before this one, that being ‘Double Identity’ which amazingly was worse than this one, your fans still see ‘Heat’, ‘Real Genius’ and ‘Tombstone’. You need to start doing right by them son.